Choose the correc frame size of your SONDRIO Carbon! Choose between two possible paint jobs for your SONDRIO Carbon! Choose the fork for your SONDRIO Carbon! The new BENOTTI SONDRIO Carbon is from now on available in sizes 27.5“ and 29“. With its overlapping frame sizes, the fitting mountain bike can be found for every purpose and every body size. The 1090 grams carbon frame – featuring a 27.2 millimetre seat tube and Post Mount disc brake tabs – convinces with best stiffness and comfort values. 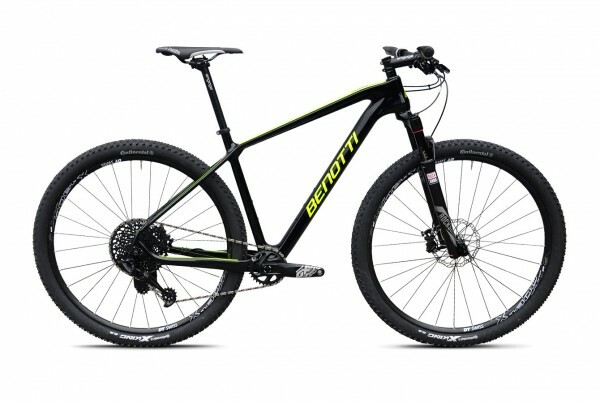 Therewith BENOTTI offers carbon technology at best value for money. The balanced geometry yields a sporty ergonomical seating position on the bike – all of this together provides ideal requirements for riders that love to ride fast offroad and set value an efficient propulsion. Frame size: 17", 19", 21"
Customer evaluation for "SONDRIO Carbon 29 - Shimano SLX 2x11"